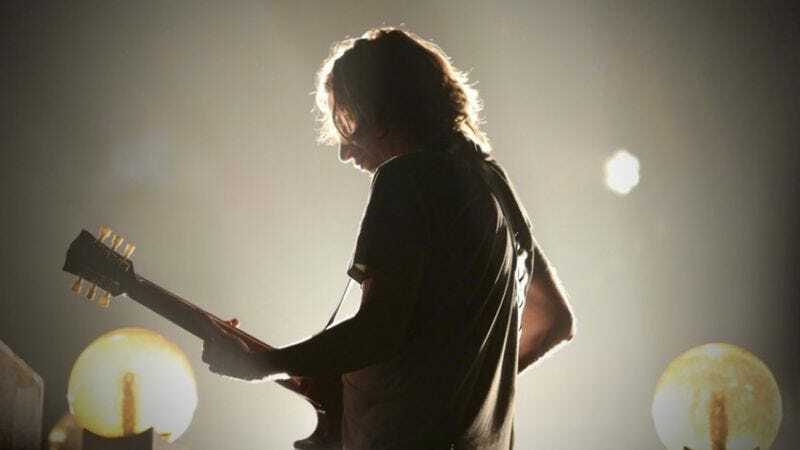 The artist: The story of Pearl Jam really begins with Stone Gossard’s guitar. A demo tape of Gossard-penned songs made its way to Eddie Vedder back in 1990, and the songs—most very close to their later Pearl Jam versions—would become massive hits: “Alive,” “Once,” “Even Flow,” and more. As the band evolved, other members began contributing more and more, but those early albums—especially Ten—bear Gossard’s songwriting stamp. For this Set List interview, we stuck largely with songs that Gossard wrote. (And in case it’s not obvious, everyone in the band helps shape the songs, but Pearl Jam’s liner notes always credit the member that originated the song.) Pearl Jam’s 10th album, Lightning Bolt, comes out October 15. The A.V. Club: “Let The Records Play” is one of the more joyous songs on the new record. Stone Gossard: It’s funny that you picked that one. Did you know I wrote that one? AVC: I did. I wanted to stick with your songs for this interview. SG: Oh, God. Well, I think that song’s good, but I don’t think it’s a standout. It’s not my favorite song on the record; I like it a lot and I’m glad it’s on there. It serves a good purpose on the record, and it’s refreshing a little bit. That song’s funny, because the backstory is that Jeff Ament wrote another song for the record—Jeff wrote a lot on this record—but he wrote this song and had this tuning. At first he said, “Oh, it’s just a drop-D tuning,” so I went home and tried playing it for ages and was like, “How does he play it? I don’t understand.” And then two days later, he’s like, “It’s this tuning” and he showed me, and all the strings were totally different than I had originally thought. So I learned how to play his song and my guitar was sitting around in that tuning, and a couple days later I just picked it up and started playing “Let The Records Play,” and I was like, “Jeff, I stole your tuning!” [Laughs.] So it ended up working out. So, that’s Jeff Ament’s tuning, he came up with that. It has this sort of swampy feel and I particularly like the intro, I really like that sort of twangy, pull-off sort of thing that you can’t really figure out. AVC: Are you the guy that brings the swing to Pearl Jam these days? SG: I think that’s a better question for somebody else, because I think we’re all influenced by each other and everyone knows each other’s feelings at this point. People could easily think I wrote something that I didn’t write, or vice versa. But I think I have my own sort of distinctive swing, for sure. I think that’s something that comes really natural to me, to push against the beat and kind of explore a triplet feel behind everything just to see what that feels like. That’s definitely something that’s a stronger suit for me. AVC: So how does the songwriting process work nowadays? You mentioned a song that Jeff brought that didn’t end up getting used—does everyone bring a chunk of songs and you whittle it down? SG: I think everyone has 10 each, and there are probably four or five of them that get demoed up. So everyone has four or five songs that are possibilities and then those just keep getting narrowed down. One part of that process is just the enthusiasm people have for it, and you want to rally for other people’s songs and also hope that other people are going to rally for yours. You want to pick the best songs from other people because, as an outsider, you can listen to somebody else’s songwriting and think, “Okay, this is sort of repeating something we did in the past or maybe this is not as interesting as something else.” But as a songwriter it’s kind of hard to listen to your own stuff with clarity. So I think we do each other a lot of favors by being enthusiastic for tracks that aren’t our own. And when Ed [Vedder] dives into something and finds a melody right away, that’s an almost sure sign that it can get finished. Jeff’s song that I mentioned, Ed didn’t have a vocal for it. We had an abundance of songs, and I think at that point Jeff had written three or four, so it’s put in the pile for next time or somewhere down the line. AVC: “Let The Records Play” recalls another Pearl Jam song about listening to music, “Spin The Black Circle.” What do you remember about writing that song? So I think I had that song on my microcassette recorder, and I played it for the band. Ed was listening to it and he didn’t really say too much about it, and the next day he came in real excited and was like, “This is great, but I did something slightly different.” He played the microcassette, but he just cranked up the speed so that it was basically double time and he was like, “Now listen to it and see if you like that.” That was basically the tempo that song ended up being. So I think when I wrote that song it was probably much more of a midtempo stomp and it ended being sort of a tear-your-head-off uptempo number. I think that song is sort of a template for “Let The Records Play.” It’s one of those songs where he celebrates how much he loves music and what it does for him. That’s always a nice place to go. AVC: It certainly felt like the most punk-rock thing you had done at that point, and it was the first single on that record. Was that a statement? SG: You know, I don’t know who picked the singles and I don’t think I ever picked one. I never know how that process works; usually the record company gets it then somebody starts talking to us and somehow at some point there’s some magical consensus. I’m always a few steps behind. I think at that time in general, we liked to come out with something hard. It’s an old way of thinking from back in the ’80s and ’90s that you want to come out and rock first. [Laughs.] So I think we were still in that mindset of feeling like we wanted to come out hard. SG: Absolutely, yeah. It’s definitely on the upper-tempo end of the spectrum. AVC: “Amongst The Waves” seemed like it had the potential to be Backspacer’s big hit, and maybe a big comeback hit for the band. Does that sort of thing occur to you when you’re writing? SG: I thought that song had some classic earmarks of Pearl Jam. I thought the chords were familiar and yet unique still—the right blend of “I’ve heard this before and I can’t quite place it” and “that sounds original.” The key it’s in is a strong key for Ed, and he sort of soars over the top of it in a way. It’s in his strike zone. It’s a positive affirmation, it’s a love song, it’s sort of triumphant in its way. So I assumed that song would have been a good single. I think it was the third single, but at that point the record was over. [Laughs.] So it never got its chance. SG: Oh, maybe that’s what it was. “Just Breathe” was so big that it sort of… I think we went with “Just Breathe” for a second single because everyone will say, “Oh, this is clearly going to be the biggest one,” and you only get 15 minutes of anyone’s attention these days so you might as well go with the song that’s going to get on the most radio stations. That song has become one of the biggest songs we’ve ever had in terms of the number of hits on YouTube. It’s pretty amazing how much life that song had. AVC: Is that sort of thing important to you guys at this point, getting on the radio? You can tour and you sell out wherever you go regardless, but is it still personally important to you to say, “Hey, ‘Just Breathe’ is on the radio” and have it be part of the zeitgeist? SG: I think when you put a new record out, everyone has a song or two that they feel people will be moved by so much that radio will be forced to play it. We don’t do a ton for radio. I think we give tickets away to radio stations and stuff, but there’s a whole hoop-jump that young bands have to do to even be considered to be played on the radio in terms of, like, Christmas parties, and you have to go to this guy’s house and have contest winners over at your grandma’s. We haven’t really done that stuff for so long, so we always expect we’re probably not going to get as much radio airplay as we could. But maybe one of the songs is so good that radio can’t really deny it and has to play it, because it’ll be left out if it doesn’t. We think “Sirens” might be one of those songs off this record. But in the long run, radio is diminished in terms of what it means. Now probably it’s just as much how many hits it got on YouTube. A million people have already watched “Sirens”, so that’s pretty exciting. It’s not “Gangnam Style,” but it’s pretty good. AVC: As the album was coming together, did “Sirens” seem like the one that would click? SG: Yeah. I love that song, and I’m so proud of Mike McCready for writing it. It has some great chords, and I get to play Mike’s role on that song, sort of, since he wrote it and is playing the acoustic part. I get to play a lot of the twangy, atmospheric guitar, and that’s kind of new territory for me. I like being the color person on a song. Sometimes the songs you write, you end up playing the rhythm guitar part, which usually ends up being kind of buried in the song because you put all this other stuff on top of it, and usually it’s not as loud as it was in your mind. But this is a song I was really proud of the parts that I worked on and wrote. I think the way the chords are laid out and the chord changes and the key that it’s in and the mood that Ed sang it, I think it adds up to a pretty good Pearl Jam song. AVC: Are there other songs you’re excited to play live from the new album? At this point you’ve just played a couple of them in front of people. SG: I’m really excited about “My Father’s Son,” which is a groover and, again, I get to play the sort of twangy, spacier guitar. Jeff and Mike both play bass on it, so I think it’s Pearl Jam’s first double-bass song. I love the straightforward groove and Ed’s cadence on that song. He’s really driving a nail into something the way he’s singing on that; it’s sort of counter-punctual the way he does that rhythm. AVC: And lyrically it’ll probably be the one that people talk about. Do you ask questions about lyrics, or is that strictly Ed’s department? SG: Sometimes you ask questions, but I think he’s proven himself to be a pretty profound lyricist. He writes from a ton of different perspectives and he touches on things from a whole variety of points of view; he tells stories from feminine and male perspectives. He’s a great writer. I think, in general, you’re not necessarily looking at it hyper critically, but you’re asking questions about what things mean, and he certainly puts it out that if people are hearing things that sound weird to talk to him about it. He spends a lot of time with his lyrics. Sometimes he’s able to write lyrics off the cuff that remain the same after even working on them a while, but he really knows the path of the words and how he wants them to come out—both the meaning of the words and the sounds of them as well as the cadence and the character of his voice. He’s a nuanced and very professional guy when it comes to that stuff. You’re excited when he’s working on something. AVC: What about something like “Bushleaguer,” which is more overtly political? Is there a conversation there, even though presumably you’re mostly on the same page to begin with? SG: I think everyone agreed with the general content, but I think particularly when we started playing it and he was sort of presenting it as a challenge… At that point he was wearing the George Bush mask and having this conversation with Bush and sort of knocking George Bush down on the ground with his guitar, and it was a big statement. In the end, the rest of us were like, “You’ve gotta do what you’ve gotta do,” but I don’t think any of us would have expressed our frustrations with the administration at that time or the general policy of going to war in the exact same way. AVC: You’ve probably talked these songs to death, but when you were doing that original demo that birthed so many early Pearl Jam songs, did you have a sense that it was a particularly inspired time for you? SG: First of all, to add a little more to the fable, that song was written in ’88 or early ’89, and it started off as a Mother Love Bone song. We’d demoed it, and Mother Love Bone had even played it at one show in Portland. So if anyone recorded the show in Portland… We don’t have a recording of Andy [Wood, Mother Love Bone singer] singing it, but it was called “Dollar Short” at that time. So when Andy passed away and we hadn’t recorded or done anything with that song, it sort of stayed in my pile of demos and I knew that I liked the way the chords lay out and it has this nice minor/major shift in it and a nice arrangement. And then Matt Cameron and Jeff agreed to do all these demos with me so I had that, and I think “Once” was one of the demos, and “Black” and “Breath.” So that group of songs were all sort of written in that period of ’89-’90. AVC: So nearly 25 years after you wrote it, is there still joy in playing “Alive” and some of those other early songs? SG: Oh, absolutely. We change our set a lot, and there’s lots of new material that we work in, which is great. Thank God we can be a band that changes its set and our fans appreciate it and have grown to accept it. But I think playing that song live and the reaction that people have, and the laughs and the smiles we get with each other playing it because we’ve played it a million times… Nothing gets boring about playing something you’ve written as a band and being a little nostalgic at the end of a two-hour-plus set. You can have this moment where it’s like, “Okay, this is the beginning, this is where we came from.” I think there’s times where it’s like, “Can’t we play something else?” but inevitably when you play that song, you see the look on people’s faces and what it does and then you go, “Okay, this is sometimes why you have to play your hits.” It can’t be just obscure all the time. It’s good to honor your hits. AVC: Did “Animal” come from that demo tape, too? SG: That was Vs. That was probably after we got back from the Ten tour, when we were still rehearsing at the Potato Head Galleries [Galleria Potato Head] down on Second Avenue in Seattle. AVC: You once said you’d interpreted the “five against one” lyric in that song as somehow relating to the dynamic in the band. Does that make sense in hindsight? SG: You see lyrics and you interpret them through your own perspective. At that time, we were succeeding, but everybody was trying to figure out what Pearl Jam was to them. And I think Ed was trying to come to grips that he’d started as this shy, quiet guy, but was now this guy that everybody recognized on the street. He was going through that moment where he had to come to grips with it, so there was some unspoken tension among the five of us in terms of both loving each other and loving being in a band and being very thankful for it and, at the same time, struggling with each other. AVC: Around the time of No Code, was that all coming to a head, or was it resolving itself? I love that record, but it has a pretty deserved reputation for sounding kind of fractured. SG: The main thing that came from that was us trying to say we were one thing for these two or three records, but now we wanted to be these other things. But the main change was suddenly having a very different drummer. Jack Irons is a very different drummer than Dave Abbruzzese, and we were trying to figure out what we were going to be with this brand new drummer. Jack’s personality was very different from Dave’s, and I think all of us didn’t know what exactly we were supposed to be at that point. It was probably people running in different directions, so I think there is less coherence to that record and a rawer structure. At the time, I think people really reacted to that like, “Oh, wow. This isn’t Vs. How come?” But I think, in the long run, it’s turned out beneficial because it sort of created that doorway for us to be able to do that again and have our fans say, “Okay, they’re kind of going down another one of these wormholes again.” Sometimes the best songs are hidden on those records and sometimes you have to figure out how to play them live before they can turn into something. So it’s one of those that I’m glad we did, and we didn’t break up before we could break through that. I think Lightning Bolt is an example of probably stronger songwriting in terms of structure and phonics and things like that. But still, there’s elements of No Code in everything we do now. We gained that territory and we’re not going to let it go. AVC: How close were you to breaking up at that point? SG: I have no idea. I don’t think that close, but you never know. And here’s the thing: What are you going to do if you break up? Everyone is smart enough to know that when they see their favorite bands break up… We watched The Police break up and went, “Wow, that was stupid.” I’m glad that we weathered whatever it was, but it’s hard to say how close we were. I have no idea what was going on in anyone else’s mind other than my own. AVC: You sing lead on “Mankind,” and it’s the only lead vocal on a proper Pearl Jam album not sung by Ed. SG: I think it is. How about that? Notoriety. At the time, we were making records pretty free-form and just picked an idea every day and did it. So there was less scrutiny about what we were actually going to record. I think I probably just recorded it with Jack Irons maybe trying to do the demo or whatever, and I didn’t know whether it was going to make it on the record or not. At that time, I was feeling very frustrated, and I wasn’t feeling as connected to the songwriting process as I did, obviously, on the first two records. It was a time where the experimental gloves had come out and if we were going to experiment, I was going to experiment, too. So that was my experiment, that I could write a pop song and I could sing it and it could be halfway legit. AVC: What about “Strangest Tribe,” which is one of a small number of Pearl Jam songs that have never been performed live? Is it the intimacy of it that keeps you from playing it? SG: I don’t know. It is a Christmas song; we haven’t done a lot of Christmas songs live. But I do like it. It’s one of those that I’d have to figure out again, because there’s a capo and it’s tuned weird. But it’s pretty haunting; I think it’s a pretty good Christmas song in general and I’m pretty proud of that one. Melodically and how it came together, I think it has that sort of ancient, Israeli brew. [Laughs.] It harkens back to Moses. AVC: A great songwriter in his own right. AVC: “Hard To Imagine” isn’t played live very often, but you have played it. What happens when you’re making a set list that brings out a deep cut like this one? SG: That one is usually going to be an opener or it’s going to be the first song of a second set. It’s a lovely song, its vocal and lyric are pretty spectacular. For a few years I had this mental block with it; I kept playing it wrong, so I kind of shelved it for a while. I was like, “Ahhh!” When it’s your own song and you’ve been playing it wrong, you have to go meet your psychiatrist and talk about it because something’s blocking you. But it’s one I really enjoyed playing and that one dates really far back, I think; probably all the way back to Vs.
AVC: So how do you guys go about making a set list? Are you all involved? Is it hashed out right before you go on? SG: It’s Ed’s process. We sort of leave it to him to begin to piece it together, and there will be days where he’s like, “I can’t do a set list. You do it, Jeff or Stone.” And it definitely used to be a more democratic process. But the longer we’ve been a band, the more important it’s been for him to find the emotional path in a set, and that’s really important. It’s a major benefit to all of us if he’s connecting with what’s going on and people are connecting with him. So he’s really good at continuing to work songs in and asking what you want to play. If you ask him to do a certain song or pull a certain song, he certainly will in general. But he’ll come up with the main set list before we go out and we’ll make adjustments if somebody says, “Oh, this one doesn’t work” or “I don’t know how to play this anymore” or “This tuning and that tuning are so similar that we don’t want to do those together.” There’s a lot of logistical reasons why you don’t want to play two songs back-to-back if everyone’s got to change guitars three times in a row. In general, he’ll spend a few hours figuring it out.